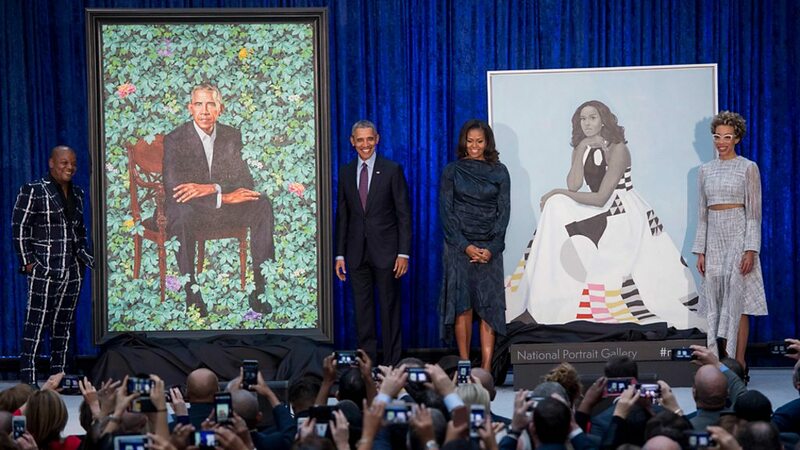 Barack and Michelle Obama have attended the unveiling of their official portraits at Smithsonian’s National Portrait Gallery in Washington DC. Former US President Obama said his portrait by Kehinde Wiley, who is known for his Old Master-style depiction of African-Americans, was “pretty sharp”. “Wow!” said Mrs Obama of her painting by Amy Sherald, another black artist, whose work addresses social justice. Steven Spielberg and Tom Hanks were among guests at the unveiling. “Nobody in my family tree as far as I can tell had their portrait done,” said Mr Obama. He joked that his yearbook picture was the closest he had come to such an honour. Mr Obama praised Ms Sherald’s painting for capturing the “hotness” of his wife. The former president said Mr Wiley was “working at a disadvantage because his subject was less becoming. Not as fly”. Ms Obama heaped praise on Ms Sherald’s work. “I’m thinking of all the girls of colour who will come and see someone who looks like them hanging on the wall of this great American Institution,” said the former US first lady. Mr Wiley painted Mr Obama in bright colours sitting in a garden, while Ms Sherald depicted the former first lady in muted tones against a plain background. “The ability to be the first African-American painter to paint the first African-American president of the United States was absolutely overwhelming,” said an emotional Mr Wiley. Reactions to the portraits were mixed. Some social media users joked that the image of Mr Obama in a garden looked oddly similar to a photo of popular singer Beyonce. Others joked that the television show The Simpsons inspired Mr Obama’s portrait. There was high praise by some who applauded Mr Wiley’s “stunningly powerful” portrayal. Several people took to Twitter to counter criticism that Ms Obama’s portrait did not look like her.